Before giving your animal any supplement, including CBD, consult with your Veterinarian. Information provided is for each serving, put drops on food or your pet's favorite treat. Please start slowly and find the right dose and serving for your furry friend. For most effective results, some animals may require more, some less. The dosing below is backed by research indicating it is a safe dosage for mammals (see below for details). Start low and go slow. 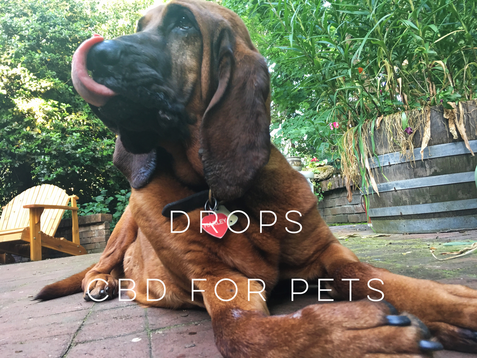 Your pet’s endocannabinoid system will need to be primed (just like yours if you’ve not exposed yourself to cannabis before) this will take up to a week, however, effects should be noticed within a few doses. Use as needed. Unfortunately the US Federal Government's classification of Marijuana has limited the scientific research on the health benefits of Hemp. However, some peer reviewed scientific research has been conducted on animals, and people across the globe have discovered, used and seen demonstrable benefits for their furry friends from use of CBD. All three founders of KeenCBD utilize our products with our pets and can personally report significant benefits. Our product is made with full spectrum Whole Hemp plant extract which may contain trace amounts of THC (please see product label for test result information or www.keencbd.com/tests). This is extremely important as THC (the psychoactive chemical in Marijuana, the stuff that "gets you high") can have negative affects on pets. When exposed to too much THC, animals will become dizzy, lose bodily controls, and can become afraid, anxious, and generally uncomfortable. A study on epilepsy in rats (completed by the University of Utah, Turkanis et al. 1979) showed the anti-convulsant effects of CBD (0.3­ mg/kg, click here for Peer Review Journal Article Abstract). This study has served as a guide for many veterinarians and pet owners to establish a baseline for dosing their animals, as well as the dosing guide we provide above. In addition, based on research by Bergamaschi, et al. 2011 (click here for the Peer Reviewed Journal Article) CBD has never had reported adverse events, even with very high doses.